Frank in Chicago wrote to ask if I could suggest any ideas for drills for [tag]basketball shooters[/tag]. Here’s a drill I sent to him that one of my subscribers sent in. Give this a try at your next practice! 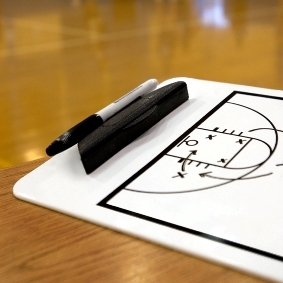 A great [tag]basketball drill[/tag] that works for my team is called the Four Corner Drill. Divide your team up into four, close to equal teams and have one guy left over. Now send each team to a spot on the court where the foul line extended intersects with the baseline. Give one [tag]basketball[/tag] to each team and one ball to the one guy that is left over (it helps if it is a different color). The guy that is left over will start the drill off by throwing it off the backboard, getting his rebound and then outletting it to one of the teams that are on the foul line extended (he then follows his pass). From there the guy who received the first pass, passes it to the team on the opposite side and follows his pass (pretty much a three man weave). Then the guy who received the second pass goes in for a layup. The two guys that are following their pass receive a pass from the two teams on the other side of the court. Now the guy who did the layup gets his rebound and continues the drill back the other way. so it is a continuous drill that can be run at anytime in a [tag]basketball practice[/tag].